There’s a brand new version out — and it only took 4 years! v4.5 features high quality AAC and MP3 streaming, schedules for all stations, and updated station listings, along with various bug and compatibility fixes. Get it here! It’s been an unimaginably long time coming, but there’s a new beta of the Unofficial BBC Radio Widget. It focuses on getting things working with the current BBC radio streams, and fixing some compatibility issues for Tiger and Leopard. Only the latest, fully-updated releases of Tiger (10.4.11) and Leopard (10.5.8) are supported, along with 10.6 and greater, including Mavericks. In a word, none. Yet. Update: Things are not as bleak as they first appeared! The official release of the widget, v4.21, is compatible with lion if you install the latest Adobe Flash Player. The WMA support in the beta versions is well and truly broken by Safari 5.1 on both lion and Snow Leopard, though; the QuickTime plugin has completely changed its behaviour. I’m gratified by all the interest that’s being shown in a Lion update, and will get one out as soon as I can. In the meantime, please use the BBC radio website for all of your cricket- and non-cricket-related needs. 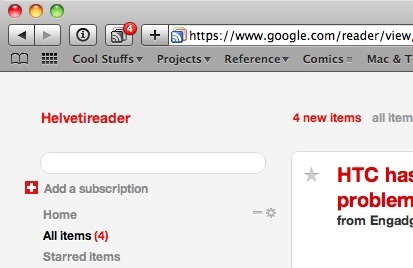 GR Tools is a toolkit with lots of neat tricks for integrating Google Reader into your browser. There’s a toolbar icon which checks for new items at regular (configurable) intervals; it’s also possible to automatically view any feed you load in Google Reader instead of Safari. You can even change the appearance of Reader — because, frankly, it’s really ugly — using some built in styles (including the beautiful Helvetireader by Jon Hicks) or your own custom stylesheet. 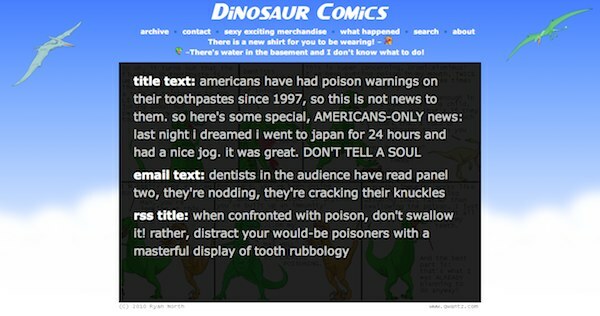 Qwantz Secrets reveals the secret texts on Dinosaur Comics when you mouseover the image — or optionally click it, or press “s”. There’s also a bookmarklet for iOS devices which can’t run extensions (and can’t see the hidden text in any of the usual ways). Both of these automatically update, and can be downloaded from my new extensions page. Bug reports and suggestions are extremely welcome. Getting Flash errors with BBC Radio Widget? The largest single problem I’ve heard of with BBC Radio Widget is a Flash security dialog, which beachballs the computer. Only a very few people get it — and I’m not sure why — but the solution is here. This is a moan — if you don’t like to hear people venting their petty frustrations, look away now! So today, I’ve waited five minutes for a train which started at the station I was at. (How did it manage to be late? I don’t know.) Narrowly avoid missing an appointment. On the way home, I miss my connection because my first train is five minutes late, and I have to sit on the platform watching the seconds tick by. I catch it, and arrive at the halfway point only to find that half the trains are running an hour late — except mine, of course, which has just left — and now I’ll be waiting an hour for the next one. Finally, I end up stuck near some smelly people (like, seriously stinking-of-something-unmentionable, smell-them-from-several-seats-away smelly). Not as bad as when I was heading to York a couple of months ago, though. £40 for a 90-mile journey, paid on the morning. Got on the (late) train, and was greeted by an announcement that we’d be further delayed. Waited ten minutes, then a further announcement that we’re moving to the end of the platform to get out of the way. As we stop, a scant thirty seconds later, we’re told the service is cancelled. And we have to walk all the way back along the platform. Awesome. No wonder people like cars. So, I wanted to listen to TMS while I work in the charity shop. There’s nothing like a bit of slightly-mad banter to liven up a slow afternoon. Unfortunately, as any real Englishman will know, it’s only available on Radio 4 LW, or Five Live Sports Extra (which is digital/internet only); and I don’t have any portable kit capable of picking it up. I also don’t have an internet connection in the shop. I do have an iPhone, but it’s an iPhone 2G and it’s running on Vodafone UK, who don’t have an EDGE network. (I’m with them despite this as they’re considerably less sucky than O2 in every other conceivable way.) That means GPRS, which tops out at a realistic 3-5kB/s. Not exactly speedy, and supporting a radio stream of only around 24kbps – considerably lower than the 48+ needed for apps like InternetRadioBox to get me delicious internet radio straight from Auntie.